A profound conception of divine truths naturally leads one to adopt various practices in obtaining the desired goal of life. While faith in the precepts of the tradition is certainly desirable, it is not sufficient in itself. There must be a method of practically realizing the truth of the object of our faith. This method is collectively called "sadhana", the means of attainment. "One should remember Krishna along with His dear eternal associates of one's own preference. With attachment to discussions about them, one should always live in Vraja." "One should serve both in his physical body and in his internally conceived spiritual body, following in the footsteps of the residents of Vraja, desiring to obtain a mood similar to theirs." "On the path of raganuga-bhakti, one should also adopt the limbs of vaidhi-bhakti, such as hearing about Krishna and glorifying Him. Thus the great sages have concluded." The object of practice, as is evident from the above, is to attain a position similar one to the eternal associates of Krishna in the realm of Vraja, the pinnacle of the spiritual world, thus exquisitely serving the Supreme Person with all of one's loving feelings. In Upadesamrita (Nectarine Instructions), Rupa Gosvami delineates six items detrimental for devotion and six items conducive for devotion, which are to be deeply considered and adopted by all sincere aspirants. Six items detrimental to the development of devotion are as follows: (1) eating too much or collecting more than necessary, (2) endeavours which are opposed to bhakti, (3) useless mundane talks, (4) failure to adopt essential regulations or fanatical adherence to regulations, (5) association with persons who are opposed to bhakti, and (6) ardent longing for the mundane. Six items favorable for the development of devotion are as follows: (1) enthusiasm, (2) firm faith, (3) patience and fortitude even amidst obstacles, (4) performance of proper activities, (5) giving up undesirable association, and (6) molding one's life similar to that of earlier saints. (1) Service in the physical body -- In his physical body, the aspirant follows in the footsteps of the great teachers of the past, engaging in various activities such as associating with saints, chanting the holy names, hearing discourses about the philosophy and the pastimes of Sri Krishna and His beloved associates, worshiping the Deity form of the Lord on the altar, and residing in a holy place. This will be elaborated upon later on in this presentation. (1) Mantramayi-upasana (static meditiation) -- The aspirant meditates on the Divine Couple seated in the midst of yogapitha (seat of union) formed in the shape of an eight-petaled lotus. The Divine Couple are surrounded by Their confidantes, namely the eight sakhis (girl-friends), who are located on the inner eight petals of the lotus, and the eight manjaris (maidservants) who are located on the next eight petals of the lotus. Following his guru who has assumed a form similar to the confidantes of the Divine couple, the aspirant renders various services to everyone in his own internal guru-given form of a maidservant. (2) Svarasiki-upasana (dynamic meditation) -- The aspirant meditates on the eight-fold daily pastimes of the Divine Couple, rendering various services which have been assigned to him (her) by the guru, and which are appropriate for the ongoing pastime. An outline of the eight-fold daily pastimes of the Divine Couple can be viewed here. Generally the meditation on the daily pastimes of Radha-Krishna is preceded by a shorter contemplation on the corresponding daily pastimes of Sri Chaitanya, who is understood to Krishna Himself in the form of His devotee. An outline of His daily pastimes can be viewed here. The practices of the aspirant naturally begin with the services performed with the physical body. In the course of time, as his understanding and ability of concentration increase, the internal practices become more and more prominent. However, the two are never to be separated from each other. They are to be adopted in a relationship of interdependence, where progress in one nourishes the other. The practices undertaken with the physical body will naturally be the prominent side of practice in the eyes of the world. Moreover, the internal, esoteric practices are not the subject matter of elaborate public discourses. Therefore, we shall focus on the external practices, which are of paramount importance in attaining genuine internal absorption in love of God. In his Bhakti Rasamrita Sindhu, Rupa Gosvami has divided the various practices of bhakti in sixty-four categories, beginning with accepting a spiritual teacher (guru), receiving initiation and instructions from him, serving him, living a life following in the footsteps of the saints, and inquiring about matters of worship (bhajana). An extensive discourse on this matter is not in place in this context, so we shall only focus on five of them, which were declared as the most important by Sri Chaitanya. In the scriptures, association with saints is declared to be the root cause of love and devotion to the Lord. In the association of saints, all aspects of devotional service become perfected. They are a living example of a practical life of devotion. One should render service to saints and offer them items they need, and lovingly accept whatever they offer in turn. One should reveal his mind to them in confidence, and carefully hear their realized instructions. One should feed them and accept their remnants with respect and devotion as a form of their grace. Anyone who has taken up the path of spiritual life is certainly a saintly person. However, to reap the full benefit of association, one has to discriminate between devotees of different grades. One should respect in his mind everyone who is inclined towads spiritual life, one should offer respects to and make friends with the one who is initiated and firm in his devotion, and one should lovingly serve the one who is realized in exclusive devotional worship of the Lord and whose heart is completely pure from the tendency to defame others and so on. Moreover, since there are certainly saints in many traditions, one should seek the association of those who are endowed with a similar inclination on the path of devotion. One should always seek the association of such saints who are affectionate towards oneself and more advanced than oneself. On the merit of such association, all spiritual practices will rapidly yield the fruit of love of God. The holy name of the Lord is nondifferent from His own form, qualities and pastimes. 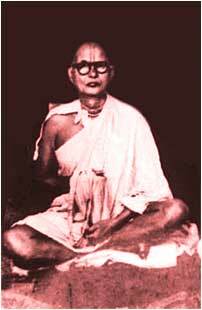 Therefore the chanting of the holy names is considered an integral part of practice in the Gaudiya tradition. hanting of the holy names is known to be of two kinds, namely "japa" and "kirtana". This mantra consists of three divine names, namely Hara, Krishna and Rama. Hara, which becomes Hare in its vocative case, refers to She who steals the mind of Krishna, in other words Radha. Krishna refers to the all-attractive original person. Rama is another name for Him, meaning the one who brings delight to Radha and who enjoys varieties of transcendental sports. In addition to the maha-mantra, panca-tattva mantra is often chanted prior to it. Panca-tattva mantra consists of the names of Sri Chaitanya and His four associates, namely Nityananda, Advaita, Gadadhara and Srivasa, along with "Gaura-bhakta-vrinda" (all devotees of Sri Chaitanya). There are slight variations for this mantra from lineage to lineage, but the basic pattern is the same. Practitioners chant the holy name according to their capacity, completing a fixed number of names for each day. Sri Chaitanya recommended His followers to chant one lakha (100.000 names), which corresponds to some 64 rounds on the rosary. The counting of malas (rounds on the rosary) is done with a separate string of beads consisting of 16 small beads on one side and four on the other, meant for counting individual rounds and sets of 16 rounds respectively. The specific number of holy names to be completed each day is largely individual, and varies from a few hundred names to hundreds and thousands of names. It is common for dedicated saints to chant 100.000, 200.000 or 300.000 holy names (64, 128 and 192 rounds on rosary) per day. As the eagerness and insight of the aspirant increases, the holy name reveals Himself proportionately unto him, eventually unfolding the entire world of divine reality along with the daily pastimes of the Divine Couple within the heart of the aspirant. Kirtana -- Kirtana refers to the glorification of the holy names which is done aloud, often with the accompaniment of mridanga (clay drum) and karatalas (hand cymbals). When many faithful aspirants gather for loudly singing the holy names of the Lord, this is called sankirtana. Such kirtana is sometimes performed in the temples, and sometimes out on the streets in processions. This sankirtana is understood to be the foremost among the sixty-four items of devotional practice. On account of its great ability for absorbing all senses in experiencing the sweetness of the Supreme Person, it is regarded as the most potent among all varieties of practice. Whereas many other practices depend on the lucidity of the practitioner's mind or on his ability of concentration, nama-sankirtana does not consider this, but instead plunges the aspirant in an ocean of divine happiness regardless of his qualification or lack thereof. During the modern age, it is understood that all devotional practices must be accompanied by nama-sankirtana to yield the fruit of pure loving devotion. "May there be supreme victory for the congregational chanting of the names of Krishna! It cleanses the mirror of the heart, and extinguishes the great forest-fire of material existence. It is a great moon spreading its soothing rays, bringing to bloom the white lotus of good fortune of the living entitiy. The holy name is the life and soul of the young bride of divine wisdom, and an ever-increasing ocean of ecstacy, and by tasting it, the self becomes thoroughly cleansed, and comes to taste at every step the complete nectar it has always longed for." The practice of nama-sankirtana is unequivocally recommended for one and all, since there are no hard and fast rules for it. It does not depend on time, place, person, articles of worship, purity or impurity. In whatever situation the holy names of the Lord are chanted, they prove to be beneficial for everyone. "O knowers of divine rapture, O saints of the world, O people filled with sacred emotions! Always relish the Srimad Bhagavatam, the fully ripened fruit of the desire tree of Vedic literatures, complete in all respects, which emanated from the lips of Sukadeva Gosvami like a gush of nectar, being the abode of rasa itself!" Though all efforts of studying the Bhagavata are certainly beneficial, the most benefit will be gained by approaching a self-realized soul who is expert in understanding the intricacies of philosophy and divine love presented in the scripture. Such a saint is the living medium of divine wisdom, and has the ability to deepen our understanding of the words of the scripture. (10) Asraya -- The ultimate shelter of everything, the ever-independent Supreme Person. The Bhagavata reveals its profound philosophical and theological precepts in the course of narrating various histories describing the Lord and His devotees. A comprehensive study of the Srimad Bhagavatam enables the aspirant to understand his relationship with the Lord, the dynamics of such a relationship, and its ultimate goal. It should be understood that the practice of hearing the Bhagavata also includes hearing and discussing literature following in the wake of the message of the Bhagavata. Over the centuries, innumerable saints and sages have elaborated on the original message of the Bhagavata in accordance with their divine insight, and the study and hearing of such writings is also most beneficial in deepening one's understanding and realization. "The Supreme Lord rapidly manifests in the heart of one who faithfully endeavors to always hear the message of the Bhagavata. Through the holes of their ears, the Lord descends to the lotus of his heart, awakening his unique, natural disposition towards Him, and cleansing him from all mundane evils, such as lust, greed, anger and so forth, just as fresh autumnal rains clear the muddy pools of water." There are innumerable beautiful writings describing the Lord's name, form, characteristics and pastimes with His beloved associates. Attentive hearing of such descriptions awakens a feeling of natural attraction towards the Lord and creates a powerful impetus for progressing on the journey for divine love for the Lord. When the Lord descends to this world with His eternal associates, His divine abode descends along with Him to serve as His playground in this world. This holy abode of the Lord manifest in the earthly realm is an exact replica of the celestial world in the realm beyond. Mathura Mandala and Vraja Mandala are two names for the sacred abode where Sri Krishna enacted His pastimes some 5000 years ago. Though such a place may appear to us as just another territory in the mundane world, it appears as such only on account of our mundane vision. The imperfect beings of this world lack the eyes to see the divine world of the Lord, which is ever-permeated with love divine. However, in the course of practice our senses and mind are purified, which enables us to behold the divine realm of Vraja instead of its illusory covering manifest to our present eyes. The various places around Vraja Mandala are a perfect impetus for invoking remembrance of the Lord's pastimes within the heart, and the association of saints living in such places, spending their time in absorption in thoughts of the Lord, can never fail to leave one empty-hearted. However blinded one may be, he can never escape the supramundane potency of such a holy place. For those unable to live in or visit places such as Vraja Mandala, it is advised that one should live there mentally by being absorbed in thoughts of the Lord's pastimes there. "The city of Mathura is superior to the spiritual world of Vaikuntha, since the Lord Himself appeared there. 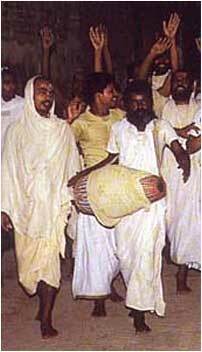 Superior to Mathura is the forest of Vrindavana, since Krishna displayed His pastime of rasa-lila (circle dance) there. Superior to Vrindavana is the Govardhana hill, which was lifted by the Lord Himself, and where He enacted numerous pastimes with His dear associates. However, above all is the lake known as Radha Kunda, since it is overflooded with the nectarine blissful loving plays of the Lord of Gokula. Where is that discriminating person who would not desire to serve this divine lake situated at the foot of Govardhana hill?" Vraja Mandala is saturated with divine love, being the personal playground of the Lord, and therefore it is a most befitting place for an aspirant who desires to perfect his spontaneous loving propensity for the Divine Couple. -- The transcendental form of the Lord is beyond the grasp of mundane sense perception. However, since there is a need for the practitioners to render concrete service for the Lord, in His kindness He assumes a form consisting of the elements of this world, visible to humans. Such a form of the Lord is called an arca-vigraha (form to be worshiped) or an arca-avatara (an incarnation for worship), commonly referred to as a deity-form of the Lord. Faithful service to the deity of the Lord allows the aspirant to establish a personal relationship of service with the Lord by cooking for Him, preparing clothes for Him, singing for Him, arranging festivals in His celebration, offering incense and flowers unto Him, and so forth. The deity forms of the Lord are of eight kinds: (1) Made of stone, (2) made of wood, (3) made of metal, (4) made of earth, (5) painted, (6) made of sand, (7) envisioned in the mind, and (8) made of jewels. After the completion of the deity form, the Lord is invoked into this form by a dear devotee of the Lord, a loving servant of His. Thus the Lord appears among the elements of this world to accept the loving service of His devotees. In addition to facilitating the development of a personal relationship with the Lord, the process of arcana (deity worship) helps the practitioner to become clean and regulated on account of the various ceremonies to be observed in relation to serving the Lord. The maintenance of both external and internal purity is essential for securing sound progress on the path of spiritual life. The practice of deity worship is particularly essential for people who are living and working in the society, since it very tangibly ensures that the service of the Lord remains the centre of all endeavors. The deity forms of the Lord are often found in temples where people gather for worship, but it is equally common for devotees to have their own deity form whom they worship at home. The most common deity forms worshiped in the Gaudiya tradition are the forms of Radha Krishna, who are installed on the altar side by side. Such service follows in the wake of the eternal maidservants of the Divine Couple, and facilitates the development of such a desired mood. Sometimes the forms of Sri Chaitanya and His brother Nityananda are installed on the altar and are served in their loving pastimes in the realm of Navadvipa. Though not as common as Nityananda, His dear associate Gadadhara is also seen on altars alongside with Him, and sometimes the complete pentatheon (Panca Tattva) of the Lord in His various aspects is worshiped. The exact procedures of worship vary from lineage to lineage. The aspirant is acquainted with particular methods of worship at the time of diksa (initiation), when the guru conveys to him the mantras to be contemplated upon and to be used in his worship along with instructions on the same. The process of arcana also includes certain internal aspects of visualized worship of the Divine Couple to be conducted in addition to the outer worship. Though some of the practices presented herein may appear rather demanding, it should be noted that everyone may adopt them according to their particular eligibility and evolve over time closer to perfection. There is certainly a long journey to be wandered in obtaining love of God, but a sincere practitioner will experience joy on every step in approaching the object of his aspirations.